Tramontana is HBA webmaster Martin Hansen's boat, purchased in December 2012. 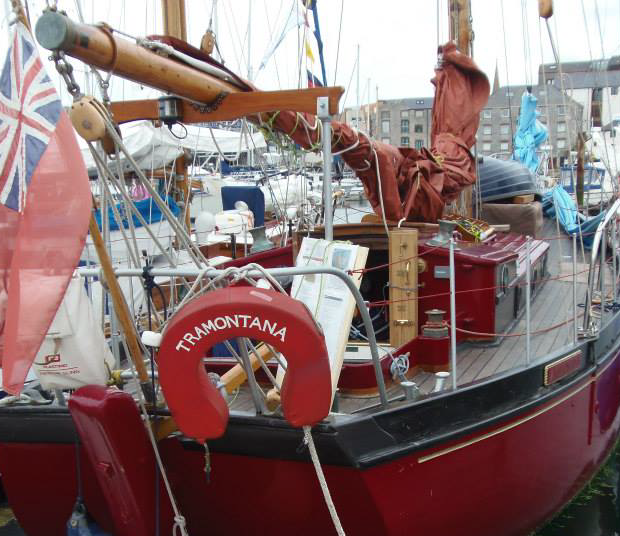 Martin writes, "I looked at eight other boats before stepping aboard Tramontana in Ipswich Marina and knew right away that she was the boat for me". For his first summer afloat, Martin took Tramontana up the Thames to Tower Bridge, and along the English Channel as far as Elderberry Cove in Torbay, where he anchored for a week, before returning to Ipswich. The following summer, 2014, Martin again headed west along the English Channel but this time on a one way trip, ending up in Penarth Marina, Cardiff. Along the way he met up with eight other Harrison Butler boats in the Solent, took part in Plymouth's Classic Boat Regatta, and called into The Isles of Scilly. The 2015 cruise saw Tramontana's head north to Fort William, then back south to Conwy, which is now her home port. She's now (2017) back in commission having had a new engine installed, and spent the summer of 2017 cruising about the Irish Sea; ports visited included Whitehaven, Dublin and Liverpool. An double page account of Martin and Helen's first voyage from Ipswich to London's Tower Bridge in 2013 appeared in The Gaffers' Log, March 2018. 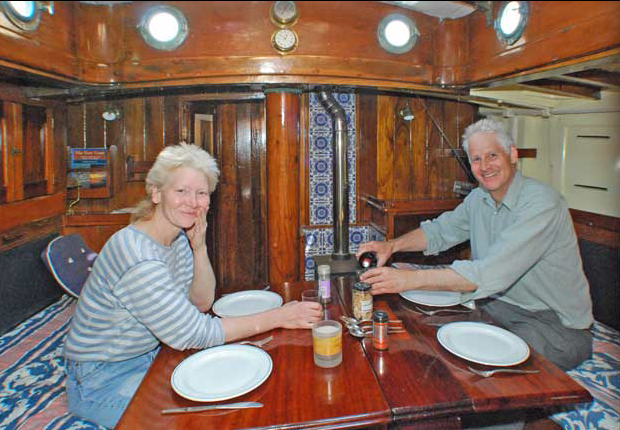 Pictured below are Tramontana's previous owners, David & Alison Batstone, in Tram's saloon. Martin writes, "I constantly thank them for handing on to me a boat in good condition that had time, money and love lavished on her during their ownership. I like the photo because David & Alison are clearly selling a lifestyle along with the boat. The broker, Adrian Espin at the Eastern Yachts Brokerage, set up the photoshoot, and I fell for his seductive sales pitch !" Alan Staley, boatbuilder with Anderson, Ridgen & Perkins, has been in touch to say that Morena, as she was then, was built as a total cost of £1370 6s 1d. A dinghy was built as a tender to go with her for £27 9s 6d. The Lloyd's survey for the Register of Shipping was carried out on 16th May 1934.